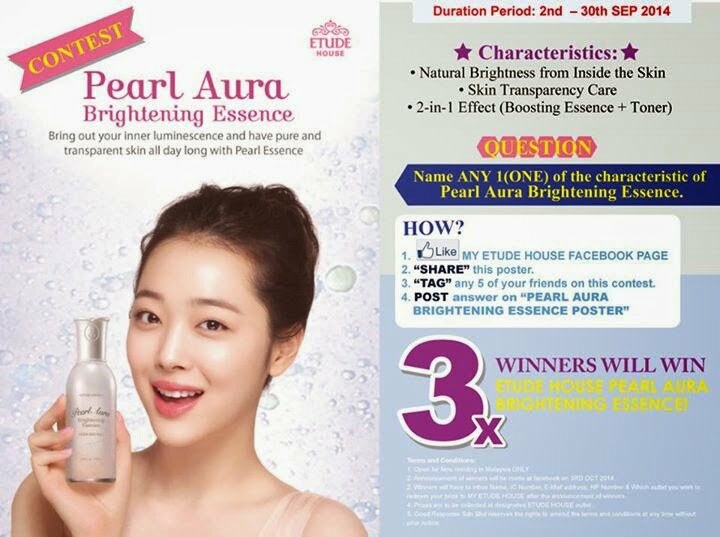 The Etude House Pearl Aura Brightening Essence (100ml) is used right after cleansing for long lasting transparent skin. The ‘Aura Particle’ inside the clear essence shines and dissolves into the skin is a natural plant luminescent extract that adds light to your skin by reflecting them by temperature and arrangement. This item is a brightening Essence containing below unique ingredients. Tahiti black pearl Mineral & nutrition in Tahiti black pearl give the skin moisture & sheen so it helps to make the skin whitened like a pearl. Aurora particle which shines the light for themselves Aurora particles, which are made in the process of the fermentation of vegetables, reflects various lights according to the array of particles & temperature since these are natural vegetable sparkling elements. It helps to make skin fresh & clear & bright like aurora. Mineral particles which open the path of light by regular array Clear Ocean Deep water which has various rich minerals helps to make your skin texture clean. That’s why it makes the skin silky. Apply proper amount to your palm and spread it on your face from the center of face to the outside like doing massage. Pat lightly to make it absorbed in your skin. While you are wondering if you can get this for free, the Etude House Malaysia is currently holding a free giveaway contest for THREE (3) lucky winners to bring this home. You can get this for free if you participate The Etude House Malaysia‘s giveaway contest. Here’s what you need to do in order to win yourself this luxurious giveaway! Like Etude House Malaysia Facebook page. Share their poster on your Facebook (please make sure you set your status in ‘public’ mode or they won’t be able to see your status). Tag 5 of your friends in their comment box (or you can tag both in your status and in their comment box). Don’t forget to answer their simple question: Name ANY 1 (ONE) of the characteristic of Pearl Aura Brightening Essence. Post your answer in their poster’s comment box. Announcement of winners will be made on Etude House Malaysia Facebook on 3rd October 2014. Prizes are to be collected at designated Etude House outlet all over Malaysia.